While contending with weak performance in the overall economy and iffy performance in some categories, Corning did offer some bright spots as it looked ahead to the next quarter of sales. Thanks to better than expected sales of televisions in North America, Corning said its LCD glass unit will have a modest increase in sales, including products generated in its joint venture with Samsung. This increase is in spite of an overall decline in pricing that is expected to take hold over the next several months. 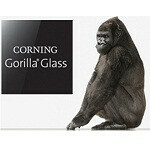 Corning is also on track to see a 5% increase in sales from its specialty materials component, which makes Gorilla Glass. That is thanks to all of us who have been buying new smartphones over the past several months, with trends expected to continue upward through the holidays. The revisions upward in TV panel and Gorilla Glass sales are expected to offset declines in other business units due to seasonal or economic factors. However, the company is also expected to see significant gains of more than 15% in its life sciences unit due to its recent acquisition of BD Discovery Labware. That is good news for us who know and love Gorilla Glass since just about every handset maker in the world uses it to one degree or another. Keep buying those gadgets!